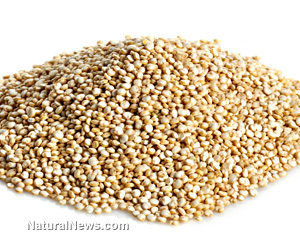 (NaturalNews) Quinoa, long-praised for the fact that it's a gluten-free food rich in protein and manganese, may have to share some of the nutritional spotlight with teff. Of course quinoa still remains an outstanding health food. But teff, which has likely been available from your supermarket and health food store for quite a while now, is fast becoming another gluten-free favorite that can be used for meal preparation similarly to quinoa (baking, for example). Teff, a grain that comes from the seed of Ethiopian grass, has a mildly nutty flavor and is typically used ground as a flour substitute. It is often also used raw to add flavor and texture to certain foods. But did you know that teff boasts significantly more manganese, copper and iron than quinoa? It also has fewer calories from fat (21 calories compared to quinoa's 55 calories) and has nearly four times as much calcium. Let's take a closer look at some comparisons between the two, all based on a 3.5 oz. uncooked portion. Concerned with slow-healing wounds, vision changes or low energy? Copper helps regulate the body's connective tissue growth, plays a role in improving eyesight and can boost energy. At 0.59 mg of copper, quinoa certainly isn't lacking, but teff's 0.81 mg of copper makes it a better option for those seeking more of this mineral. Copper also has cholesterol-lowering benefits, can help regulate heart rhythm and even reduces thyroid problems. Need more iron? Teff comes in at 7.63 mg, while quinoa has 4.57. So if you suffer from low energy and fatigue from anemia, want improved brain health and better cell-to-cell oxygen distribution, teff is the way to go. When it comes to calcium, teff once again steals the spotlight. With 180 mg versus quinoa's mere 47 mg, teff's a great go-to superfood for building strong bones and possibly providing diabetes and blood pressure management. This news isn't to say that quinoa should be abandoned. It's still an incredible, gluten-free food that packs a powerful nutritional punch. In fact, it has more protein, potassium and omega-3 fatty acids than teff. So, it's more of a matter of what nutrients you personally require. In some cases, quinoa will be your better option; in other instances, you'll want teff. As with any healthy diet, balance and variety is key. So why not incorporate both into your diet?